If you've ever been to Angel Island or Alcatraz Island in the San Francisco Bay, you may have seen them. 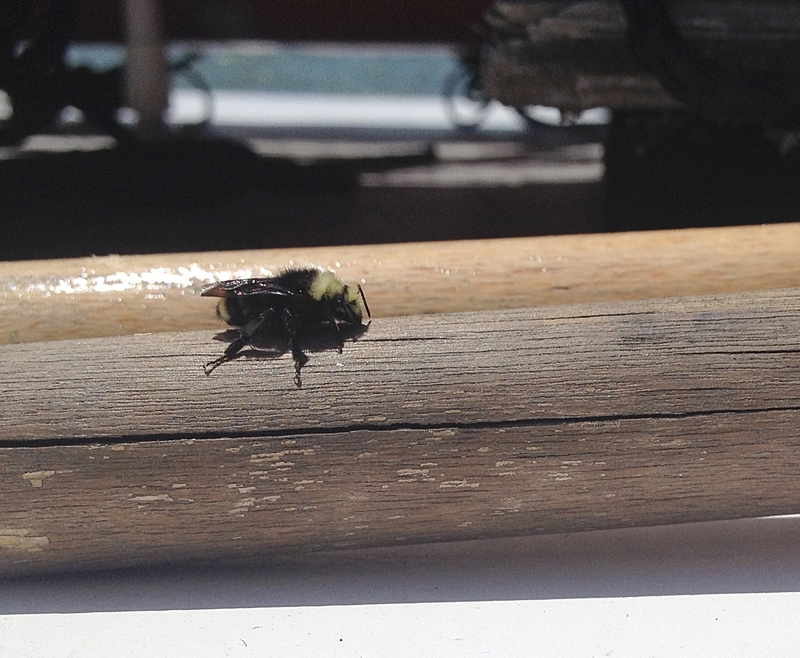 And sometimes if you're fishing in the Bay, a bumble bee may land on your boat. That was the case Monday, May 28 when the sportsfishing charter boat, The Morning Star, left its berth at Loch Lomond Marina, San Rafael, and headed out to the Bay to search for what skipper Gordon Hough calls "meals on reels." The Morning Star encountered the bumble bee about two miles north of Angel Island, near the Richmond-San Rafael Bridge. Native pollinator specialist Robbin Thorp, emeritus professor of entomology at UC Davis, later identified it from the photo below as a female Bombus vosnesenskii. Nobody was catching any halibut or stripers at the time, so some of the anglers caught an image of the yellow-faced bumble bee. "I thought it was remarkable to see a bee flying around in the middle of nowhere," said Hough. "She was probaby just too lazy to fly the distance and decided to hitch a ride," quipped Thorp. "Wonder if she does a daily commute to find a better patch of flowers." Thorp says that bumble bees are "larger, stronger fliers than honey bees and can potentially fly for several miles." "They have occasionally been found on boats off shore, but like honey bees, they tend not to forage across wide strips of water," Thorp says. UC Davis forensic entomologist Robert Kimsey, who does fly research on Alcatraz, has seen bumble bees on Alcatraz, too. No honey bees, but bumble bees. As for Hough, he says he has no plans to offer bumble bee charters. 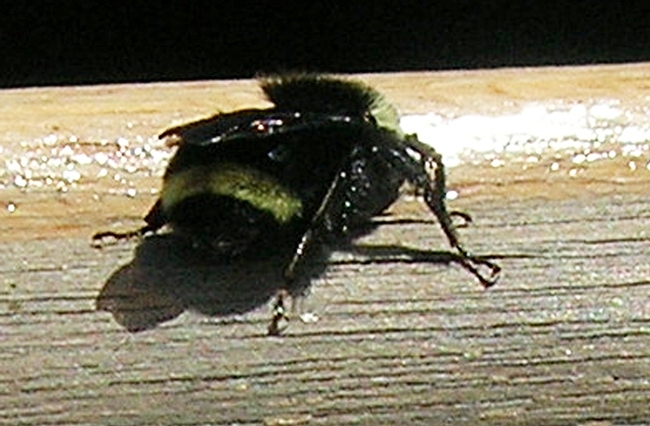 The characteristic yellow band on the abdomen of Bombus vosnesenskii. The bee landed on the boat and after a 10-minute rest, took off. 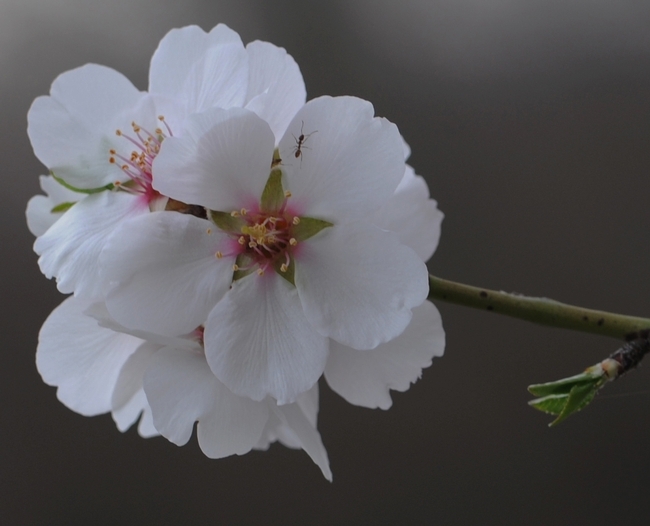 Almond pollination season in California traditionally begins around Valentine's Day. 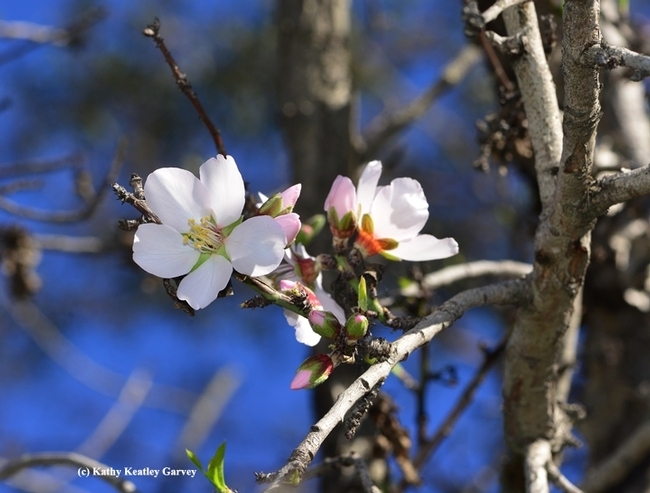 This year, however, thanks to the unseasonably warm weather, almond trees began blooming in late January in some parts of Central California. Take the city of Benicia. Its temperate climate is conducive to early spring. 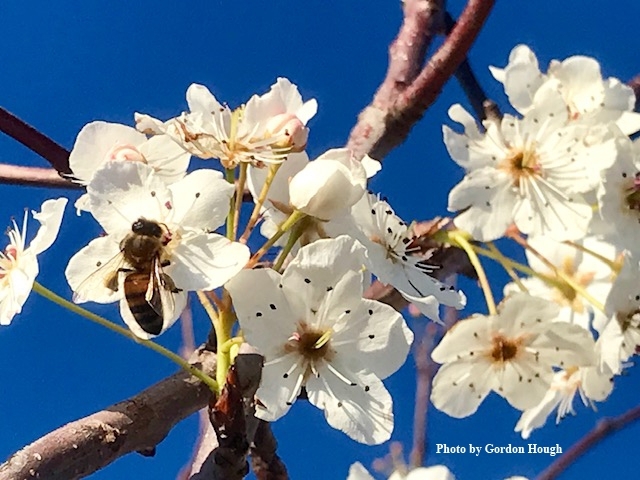 Today as the temperature climbed to 58 degrees, we saw almond blossoms everywhere--at the entrance to Benicia State Park, in residential yards, in fields and meadows, and lining city streets and roads. Benicia resident Gordon Hough, who owns and skippers the sports fishing boat, The Morning Star, didn't go fishing for sturgeon and bass today, but he did go jogging in Benicia State Park. 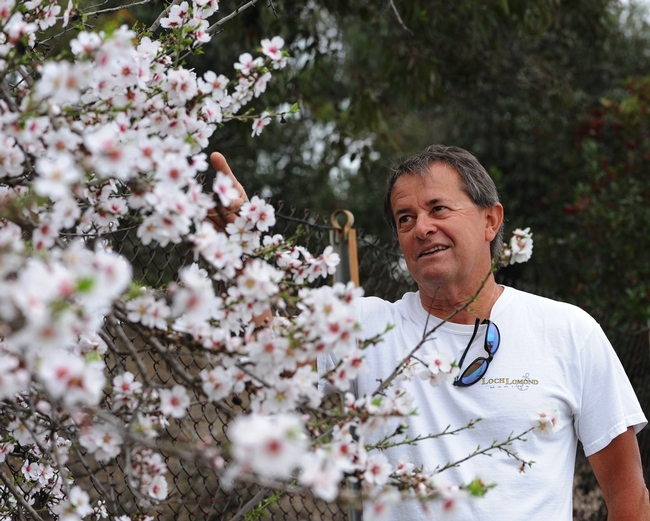 On his way home, he stopped to check an almond tree for honey bees. No bees. But one ant. It should be a great year for almonds. 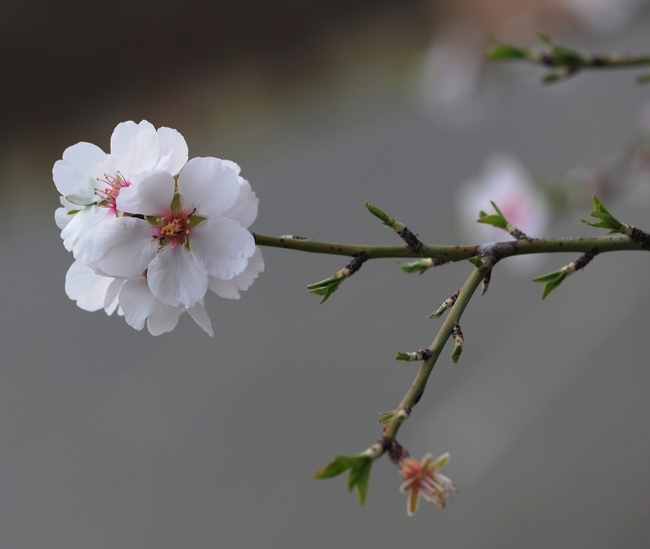 The USDA's National Agricultural Statistics Service projects a record 2600-pounds-per-acre yield for the 2011-2012 California almond crop. That represents an increase of 200 pounds per acre, or 8 percent, over the previous yield-per-acre record set in 2008-2009, the NASS officials said. This is what the California Almond Board had to say in its September 2011 newsletter: "The California Almond objective forecast for the 2011–12 crop year is 1.95 billion meat pounds, which is based on 750,000 bearing acres. Overall, shipments were up 13 percent, reaching 1.668 billion pounds and marking the fifth consecutive year of record shipments across domestic and export markets. "For the second year, California shipped over 1 billion pounds to export destinations, an increase of 15 percent over 2010–11. Domestic shipments were up 9 percent over the previous year, at 490 million pounds. The top five export destinations (China, Spain, Germany, India and the United Arab Emirates) account for approximately 53 percent of total export shipments, while the top 10 destinations account for over 72 percent of export shipments. For the first time, China became the leading export destination, with shipments rising by 26 percent to reach 168 million pounds." 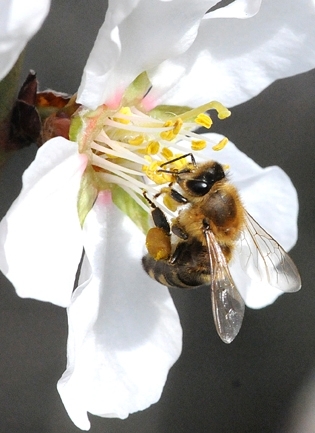 Meanwhile, it takes two hives per acre to pollinate California's 750,000 acres. The bees, trucked here from all over the country, are in holding yards and ready to go. The orchards will be abuzz soon with millions of bees pollinating the blossoms.